Today I continue to share a few tips for successfully navigating the narrow path, the one Jesus calls us to follow Him on. Some of these are bona fide spiritual disciplines. Others are simply biblical mandates that seem to help us stay closer to our Guide, avoid pitfalls, and enjoy the journey along the way. 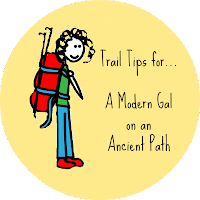 Because hiking does require a degree of exertion and caution, I'm prone to keep my eyes on the ground when navigating the trails, gauging my steps and watching for danger rather than enjoying the scenery around me. To a degree that's wise. We have some rocky paths here in southern Arizona. But if I never take a moment to look up, look around and take in the beauty surrounding me, then I've missed much of the joy of my journey. So when I'm out for a hike I force myself to slow down occasionally and look around. I pause often to stand still and listen to the breeze blowing through the trees and the sounds of animals around me. I even stop at times to look back at the trail I've just traversed, recognizing that the scenery looks amazingly different from that vantage point than it did when I was walking forward. In the same way, it's wise to pause occasionally in life to take in the beauty of the "trail" we travel. It's smart and healthy to appreciate what's going on around us, the sights and sounds of our lives. And it's even a good idea to look back at yesterday, last month, last year to see where we've been, where we've come from, how things look from this new perspective. What I'm really suggesting is that we appreciate the blessings of our lives as we live them. When we have an attitude of gratitude, the journey seems a little easier, the exertion seems more worthwhile, and the challenges have a purpose. We cultivate such an attitude of enjoyment when we choose to thank God for His blessings. Truly, I've found thankfulness to be a conscientious choice I must make. Charles Spurgeon once said, "Let us daily praise God for common mercies -- common as we frequently call them, and yet so priceless that when deprived of them we are ready to perish." Today I challenge you to lift your gaze from the path long enough, frequently enough, to thank God for dozens of "little things." Things like your computer, your cell phone, your coffee, your favorite candy. Things such as electricity, vitamins, traffic signs, libraries, and songs on the radio. Maybe you could praise Him for providing you with knowledge, emotions, dreams, or energy. We could even thank Him for such simple things as paper clips, potting soil, pink lipstick, and pure drinking water. This January I began a Thankfulness Jar. It's a large glass jar I keep on my desk with the goal of writing down and putting into the jar at least one thing for which I'm thankful every day. I've not done that every day. But I have managed to accumulate quite the little pile of white strips of paper on which are printed the little and big thanks for which I praise God. And it's made a difference. This little tool has given me a fresh appreciation of the trail I'm on. This morning I read in a devotional guide that we should even thank God for the problems in our lives. That caused me to pause. But couldn't it be that our problems, just like the tough and challenging climbs on the hiking trail, lead us to the greatest vistas of God's handiwork in our lives? Surely we can trust and even thank the God who "works all things together for our good." Want to enjoy the trail, not just endure it? Learn to appreciate it. For what are you thankful today? Could you name us 10 things for which you give thanks? That would bless me to no end!